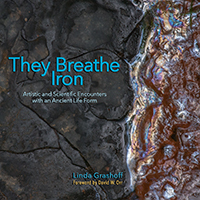 This entry was posted on November 23, 2018 by Linda Grashoff. It was filed under Built Environment, Dumpsters and Trashcans, Essay, Surfaces and was tagged with abstract, dumpster, photography, pollution. I love your dumpster images but recognise the conflict as well. Your short essay is spot on in its description of the issue and the best and probably only realistic approach we can take to it. Thanks for clicking through to the essay, Alastair, and thanks for your generous comment. I understand the comments that Alan makes as well as your essay about finding the beauty in something that has other universal consequences for us in terms of ecology. I struggle with this as well in my current work where I am making dresses out of plastic bags. The dresses are something that holds at least the possibility of being pretty, something we can associate with the idea of beauty. Something that references women’s work in its sewing and use of materials on hand. But am I just making larger objects with plastic bags that will be harder to recycle, reduce or reuse? Or is it worth the effort to make something that carries a message that will be seen in an exhibit causing someone to think about all of the plastic they are using? Like you and Alan, I don’t have any clear answers. But somewhere in my heart I feel that making a point, that the message about the necessity to think about the abundance of plastic bags is important for me to pursue. Thank you, Clare, for expanding this discussion. It seems to me that your plastic-bag dresses carry a positive message (causing someone to think about all of the plastic they are using as well as references to women’s work and using materials at hand) that is louder than the negative consequences the art works themselves. But you’re right; it’s still a concern. Here are two links to keep the conversation going: http://www.ethicsingraphicdesign.org/one-mans-trash-is-another-mans-treasure/ and https://www.youtube.com/watch?v=L35R-GQOL9E. Mentioned in the first link, the second link is to the film about artist Vik Muniz’s project, Waste Land. First, I’m happy to see the photos, once again drawing us in to what might be describes as a mysterious world of beauty in unexpected places. 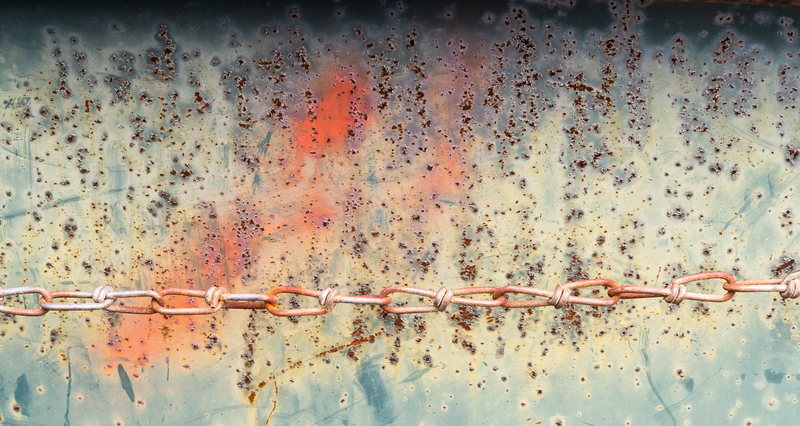 I like the chain – a new touch, and well seen, with those colors and textures. 🙂 Your essay is excellent! It’s very well written (and illustrated, of course). Clear, even-handed, thoughtful, concise. You know I always go for the both/and instead of the either/or, so your conclusion sits well with me. Thank you! Thank you, Lynn. I don’t know what that chain is used for; it’s part of this dumpster, and I’ve seen similar chains on the sides of other dumpsters. I’m glad you like the essay. Both/and seemed the only way to go with this; I didn’t want to give up on either side. But read what Adrian has to say. Thanks, Adrian, and thanks for another perspective. I prefer that my photographs have a message, but I often have to ask myself what message certain of my photographs carry. 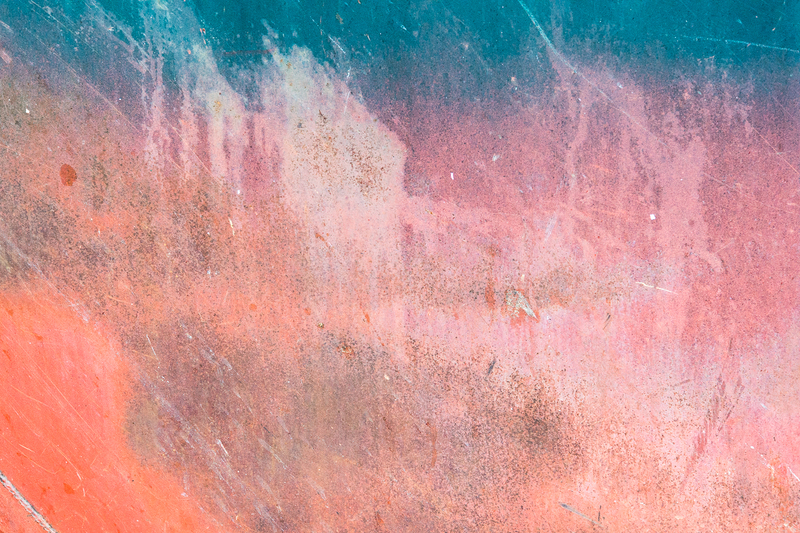 I have written before (https://lindagrashoff.wordpress.com/2018/06/10/and-happy-ever-after/) about my love of the material world and its significance to my photography. So my message is always that the physical world is real and I love it, but since that thought could pertain to all my photographs indiscriminately, I like when I have another answer as well. I hope that those who simply want to create beautiful/striking/artistic/etc. etc. images continue to do so. There’s room for everyone. In thinking more about those who simply want to create beautiful/striking/artistic/etc. etc. images, I wonder if you might accept that those images also carry a message: that there is beauty in the world and/or in the hand of the artist. Maybe (I’m trying out this idea here) we can’t help but convey a message with our images. And to your point here, yes, there will always be some who think there is only one way to create art or believe or not believe. They are the ones who are missing out on the richness of the world. Yes, you’re right, Adrian. It sounds like you are more accepting of this kind of diversity than maybe I am. It’s a hard truth. I don’t know if you’ll agree with the BBC’s treatment of this story, Adrian, but I’ll add a link for people like me who may be only vaguely familiar with the Christmas Truce of World War I: http://www.bbc.co.uk/guides/zxsfyrd. Wonderful essay in Eureka, Linda: beautifully written and chock full of enlightened thought. It also gave me a renewed appreciation of your dumpster work. Just want to be clear about my original question: It referred only to those photographers who are trying to draw attention to an environmental or social issue, and thereby hoping to galvanize action for change. In those cases, it seems to me that beautiful images send a contrary message, or undermine the severity of the problem and need for solutions by distracting us with their siren calls. Finding beauty in places where most of us would never look for it is a different mission however than the artists or photo journalists making impassioned calls for reform. To me, the former is a form of recycling that tries to make the most out of an unfortunate situation and isn’t at all condoning it. Happy to know you like the essay, Alan, and the dumpster work. Thank you. As for photography that is effective in drawing attention to environmental or social issues, I think it must at least not eschew good composition because composition isn’t only about the beauty of the composition; it’s also about pointing. Of course what good composition is, especially in such cases, is debatable. So maybe my insisting on good composition doesn’t really get us anywhere. Perhaps, if I understood him correctly, echoing what Adrian said, so many of us as individuals want a better way but the reality is that we are just a dirty, wasteful, destructive, and invasive species in the natural environment. So if you can accept that, the oil and gas slick on the parking lot are just part of the natural world…. Thank you, Mic. I can’t tell you how glad I am that what I have posted on this blog has been useful to you. I won’t be deterred, but right now I’m getting ready for the trek to Florida and will probably lag a bit. Your addition to Adrian’s comments is intriguing. Thank you for it. Best wishes for a warm and enjoyable stay in Florida. Thanks for your good wishes, Mic. I hope we can do better, too. I love anything rusty and weathered. These make excellent abstracts Linda! Thank you, Denise. I confess that I ogle every dumpster I walk by. People must wonder what I’m up to. My friend Phyllis wrote a comment on my LinkedIn page that doesn’t transfer over here. She enlarges this discussion even further, and I want to include here what she said so that more may appreciate it. I thank Phyllis for her valuable contribution. 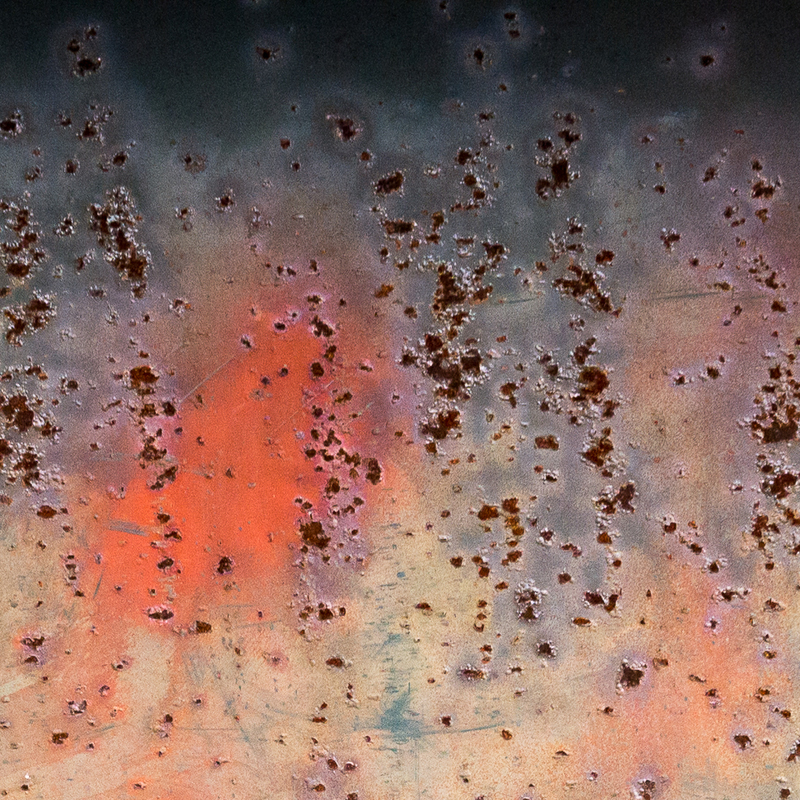 I find these abstractions appealing, no matter that they’re from dumpsters. 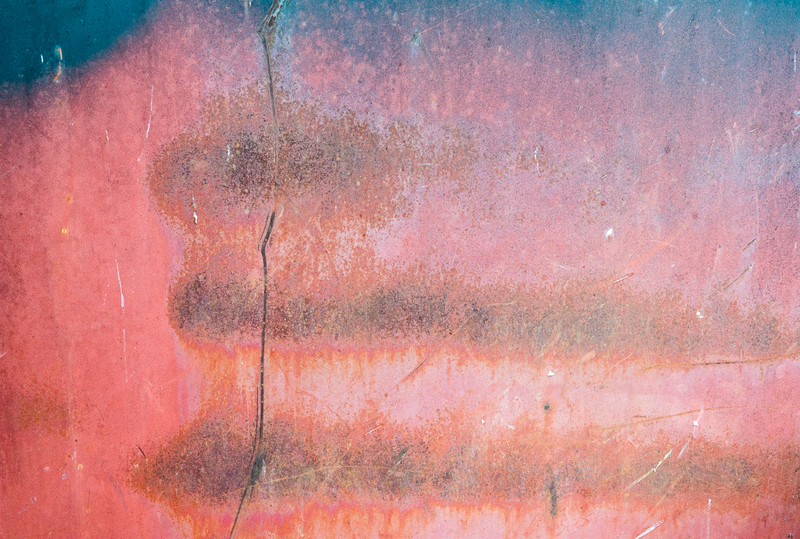 Oxidation is impartial. Thanks for weighing in, Steve. We seem to want to believe that nature intends us good when it gives us beautiful sunsets and means us harm when it lashes us with hurricanes. But as you say, nature lacks intension. It is simply the manifestation of the laws of physics, biology, and such. If we can understand how these laws work, we may be able to influence some of their actions. But I dare say humans will never be able to take full charge of nature; there are just too many variables.